This is good advice and perhaps one day I’ll follow it. All too often good actors who can recall lines on a moments notice, remember the blocking of a long forgotten scene or call up an emotion from a way past memory do not have a clue where they left the contact number of a casting director they just met. If you have an office like I do or just a work area, no doubt there are piles of pictures, resumes, plays you want to read and a smattering of loose papers with numbers for workshops, scene study and maybe even potential jobs. Organize my friends, organize. In the old days we carried notebooks(and I still do) but now it’s merely just the action of an entry in a smartphone to stay in touch with someone who may have said,”Call me”. Keep your head shots and resumes ready to go(meaning updated) and always in the same place. If you have resumes on IMDB and other online web pages make sure you update them as well. You never know who checks these things or when. Stay in touch on a regular basis with the contacts you do have. Not in a pushy way(I really, really need a job)but just a note reminding the recipient of an upcoming, show, showcase or role you’ve been cast in or just, “checking in with a reminder to keep me in mind if you have anything coming up.” It doesn’t take much. And a postcard in a business envelop I think adds a little class. An e-mail can be sent from anywhere and while convenient is more easily deleted than, sorry to say, chucked into a wastebasket. I write this simply because I realized I don’t do enough of this. My friend Ron Canada who works all the time(I meaning all the time)has a photographic memory. He can walk into a cold audition, remember everyone in attendance and greet them by name when he gets his call backs. 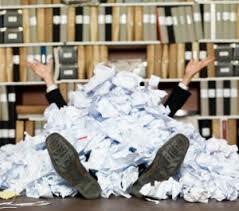 I’m not blessed with that talent as most of us are not, so all the more reason to …organize those piles a’ paper!